Most buyers highly recommended the Adidas EQT Support 91/18. The large percentage of buyers shared that they felt that this model is very comfortable. An EQT shoe collector even tagged this model as the most comfortable among all the EQT sneaker versions. Many loved the retro yet stylish appeal of this footwear. Few noted that the Adidas EQT Support 91/18 is made of high-quality materials. A handful of wearers mentioned that they liked the versatile look of this pair that could be matched with almost any attire. One even shared that owning this pair is a practical move. One writer liked that Adidas added a distinct element across the forefoot of this model. A couple of buyers cited that they love that Adidas used the OG color combination. Several buyers found this pair very lightweight. Not many reviewers liked the midsole bricks that reminded them of the NMDs. One buyer pointed out that he enjoyed the excellent heel support of this kick. At $180, many found the Adidas EQT Support 91/18 slightly expensive. Few reviewers criticized that this pair runs a tad small and tight than their regular fit. Some of them suggested grabbing a half size bigger for cozier strides. A couple of reviewers complained that it is so hard to put on this pair as they found the opening of this sneaker hard. The Adidas EQT Support 91/18 exhibits modern details stirred from the Three Stripes' archives. This model has a slimmer profile compared to its predecessor but injected with several elements to make it more stable, durable, and comfortable. Majority of critics highly recommended this kick as they found this comfortable and lightweight. Many buyers also noted this model's stylish appeal, making it a versatile pair for virtually any laidback stunts. All these merits plus its high-quality materials definitely off-sets its slightly pricey tag. This shoe is worthy to be talked about by the fresh generation of Adidas' supporters. Adidas and Peter Moore, the designer of the legendary Nike Air Jordan 1, collaborated in the early 90s to come up with footwear that contains only the basics and nothing that is not. They aimed at engineering shoes that will reflect the sense of individuality and create an alternative design to the pop culture. This partnership came up with the Equipment Range or more popularly known as the EQT. The Adidas EQT line is composed of shoes that will enhance the performance of its wearers while staying comfortable. The brand debuted the EQT in the green, white, and black combination of hues, which is unusual in the era when the pop of vibrant colors was seen on almost all the accessories. This line also dropped the Trefoil logo and used the iconic 3-Stripe branding, stirred from the Adidas Performance division's logo. EQT catered a wide range of sports - volleyball, basketball, fencing, soccer, and running and gained its tag as the best footwear for serious athletes. A few years after, Adidas Originals revived and introduced several variations of EQT to the public to suit the variety of needs of its consumers. All these are guided by the core idea of the EQT Range "To keep everything that is essential, and nothing that is not." As a follow up to the success of the rebirth of the EQT Support, Adidas Originals unveiled another version in September 2018. The Adidas EQT Support 91/18 is considered special as this silhouette is the combination of several EQT elements from the past, most prominent is the EQT Torsion from 1991. The sidewall cages and the newly retooled midsole are the most notable heritage elements on this contemporary sneaker. The low-top Adidas EQT Support 91/18 features elements from Adidas’ archives that have been modernized for the current market. The upper is composed of a combination of various materials making this model more striking. The gray soft knit on the forefoot is extended up to the quarter for a more breathable fit and stylish look. Also, the structural support cage and eyelets are made of stiff TPU in white and green colors to add retro yet modern style. Meanwhile, the 3-Stripe extended on the Boost midsole is also in green to contrast its white Boost background. This model is launched in its OG colorway - Core Green/Clear Granite/Sub Green which enhances the entire appeal of this kick. Styling this sneaker is relatively easy, as it displays versatile design and timeless colorway. The Adidas EQT Support 91/18 looks good on feet especially when paired with denim jeans, rolled-up trousers, ankle pants, and even with their shorts. Tracksuit or cycling shorts with oversized t-shirts also works on this sneaker for the workout-ready look. This model is delivered solely in men's sizing. 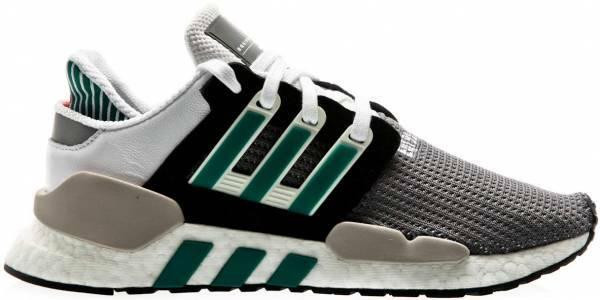 The Adidas EQT Support 91/18 for men is offered from sizes 5 to 14 US in medium width. Its lightweight and advance tech Boost midsole provides responsive cushioning suitable for day-long use. Meanwhile, the front lace-up closure system delivers a personalized, secure fit. For additional support, the brand added TPU plastic keeping the feet secured. This TPU cage is surrounded by a suede square to lock the TPU in place while working as additional eyelets for the laces. The Adidas EQT Support 91/18 has the white 'EQT 91/18' typescript across its forefoot, which sets this kick apart from the other EQT models. This bold detail has been consistent in the silhouettes unveiled by the brand in recent years. Also, the color scheme used by Adidas is noticeable as it gives most of the wearers authentic retro vibe. Another striking element is the heel and ankle of this shoe made of soft and durable mesh to keep the feet cushioned, ventilated, and supported. The brand also added layers of smooth leather on the heel and suede on the TPU cage to insert variable color blocking. Lastly, the Boost midsole was popped in with several elements to enhance stability and charm. The two bricks on the lateral side are reminiscent of the midsole plugs of the NMD. Also, the iconic rubber 3-Stripe extended to the Boost works to heighten the support of the outsole. It has the TPU heel piece inserted on the midsole to provide stability. The Stealth rubber outsole contributes to overall lightness and gives high-traction for reliable grip. The midsole of this sneaker is composed of the whole slab of Boost technology that offers the most responsive cushioning. This technology is considered the most groundbreaking innovation from the Three Stripes. It is made of thermoplastic polyurethane (TPU) that absorbs shock effectively providing a consistent run. Packer and Adidas collaborated to come up with a collab of the EQT Support 91/18 that displays Primeknit upper blended with wool resting on top of black Boost midsole. To further elevate the luxurious vibe, this collaboration was finished with tan hairy suede on its heel, leather liner, and quarter panel in black suede.